ATLANTA, GA (July 26, 2016) – EMMY-winning television host and radio star Steve Harvey hosted an unparalleled night of entertainment and inspiration at the 2016 State Farm Neighborhood Awards show on July 23rd in Las Vegas, at the Mandalay Bay Resort and Casino. 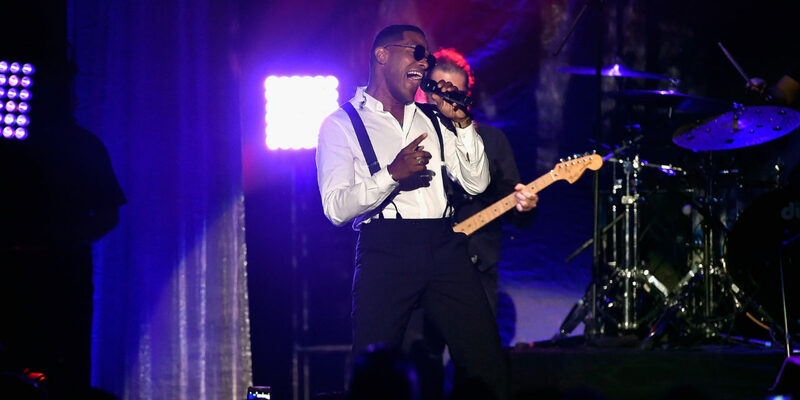 Featuring superstar performances from Maxwell, The O’Jays, and Erykah Badu, which had the sold-out crowd cheering and dancing, the 2016 State Farm Neighborhood Awards was a don’t-miss night filled with side-splitting laughs, inspiring speeches of celebration, singing, an impromptu dance party, and more. The three-day sold-out 2016 State Farm Neighborhood Awards Weekend took place in Las Vegas July 22nd-24th. EMMY-winning television/film/radio producer Rushion McDonald produced the entire weekend for the 14th year, with Las Vegas attendees clamoring for the event to return to Las Vegas next year. Gathering together in celebration of a positive community purpose, the 2016 State Farm Neighborhood Awards show included appearances from Toni Braxton, Wendy Raquel Robinson, Sheryl Underwood, Terrence J, Bern Nadette Stanis, Lavell Crawford, Yolanda Adams, Lalah Hathaway, Earthquake, Sommore, Benjamin Crump, Ed Gordon, Shirley Strawberry, Nephew Tommy, Carla Ferrell, Junior, and State Farm’s Duane Farrington. Driven by public nominations, with repeat and first-time winners unveiled, the show also included special painting presentations and check presentations from Cracker Barrel to the Best School Teacher winner and State Farm to the Good Neighbor Award winner in support of their community efforts. The 2016 State Farm Neighborhood Awards Weekend was held at the Mandalay Bay Resort and Casino, where the events included the three-day State Farm Color Full Lives Art Gallery experience, the State Farm Sing Your Way Contest and Freedom Friday Concert with headlining performances from Charlie Wilson and Keith Sweat, the Freedom Friday Party featuring Doug E. Fresh, the Neighborhood Awards VIP After-Party, and Jill Scott headlining the Neighborhood Awards Beach Party. Steve Harvey and Rushion McDonald created the one-of-a-kind State Farm Neighborhood Awards (formerly the Hoodie Awards) and State Farm Neighborhood Awards Weekend to recognize and celebrate men and women from all over the United States who uplift their neighborhoods through their contributions and excellence as entrepreneurs, religious and community leaders, educators and more. The 2016 State Farm Neighborhood Awards Weekend included support by State Farm, Tracfone, Masterbuilt, Cracker Barrel, McDonald’s, Crème of Nature, DHerbs, and Wells Fargo. For information, to catch a replay of the live backstage stream, and more from the 2016 State Farm Neighborhood Awards Weekend, please visit www.NeighborhoodAwards.com.